In business, productivity is everything. When you first started, you naturally had to wear many hats. You had to be the marketer, customer service, sales rep – all rolled into one. But, as your business grows and you bring on staff, your role must shift from doing to delegating. Otherwise, if you never make the shift, you’ll always be stuck in the middle of your business. That means you’ll struggle to take vacations – without having to run your business. You’ll hoard tasks because you don’t trust that your employees can get the work done. And, more importantly, you’ll slow your business down because you can’t get everything done. The first step to getting unstuck is to recognize that you can’t do it all. You hired your staff for a reason and they should be experienced enough to execute. If they’re not, then find new employees that you know can do the job right – every time. Next, you have to embrace delegating all of your tasks. Stop telling yourself that you are the only one that can do the work. You just haven’t found the right person who can take it over, but it can be outsourced if you know where to look. By having the “I can only do it” mindset you will never be able to step away from the business and enjoy the freedom you deserve. Finally, put metrics and goals in place. This helps you to keep your teams on track. 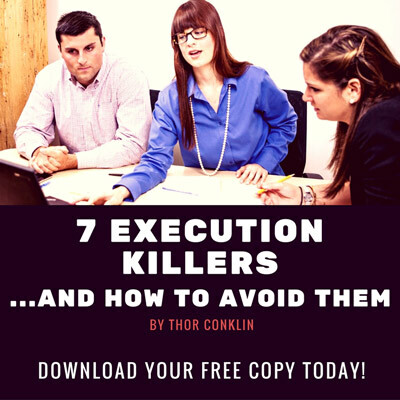 Avoid delegating work without clear expectations and deadlines in place. This way you can ensure that everyone is on the same page and that you have defined deliverables for your employees to meet. If you must stay attached to any task within your business, make sure that it is where you can bring the most value. For example, posting on social media can (and should) be outsourced, so you can free up that time to identify business opportunities or network with customers. Reflect on what you enjoy the most, and what you do the best, then focus your energy in those areas to truly grow your business. So, I challenge you to go through your business and find at least 2 tasks that you can delegate to free up your time to start working on your business, and not in your business.